Inclusion effect of soybean meal (SBM) and fermented SBM (FSM) in extruded pellet for juvenile abalone (Haliotis discus) was compared in abalone farm. Dietary inclusion effect of the combined macroalgae (MA) (Undaria pinnatifida and Hizikia fusiforme) and a single Saccharina japonica on abalone was also compared. Three thousand six hundred juvenile abalone were purchased from a private hatchery and acclimated to the experimental conditions for 2 weeks. Six 5-ton flow-through raceway tanks were used, and abalone were randomly distributed into tanks (n = 600 per tank). Three experimental diets were prepared in duplicate. Fish meal, FSM, corn gluten meal, and shrimp meal and wheat flour and dextrin were used as the protein and carbohydrate sources, respectively, in the FSM diet. MA was also included in the FSM diet. FSM and MA in the FSM diet were substituted with SBM at the expense of wheat flour and S. japonica, referred to as the SBM and SJ diets. The experimental diets were pelletized by an extruded pelleter. Water stability of nutrients in the experimental diets was monitored at 12, 24, and 48 h after seawater immersion. The experimental diets were fed to abalone once a day to satiation with a little leftover for 120 days. The retained crude protein and lipid and ash content of the extruded pellets were changed over all period of time. Weight gain and specific growth rate (SGR) of abalone fed the SBM diet were greater than those of abalone fed the FSM and SJ diets. Weight gain and SGR of abalone fed the SJ diet were also greater than those of abalone fed the FSM diet. The longest shell length, widest shell width, highest shell height, and greatest soft body weight were obtained in abalone fed the SBM diet, followed by the SJ and FSM diets. Proximates of the soft body of abalone were not different among the experimental diets. In conclusion, SBM was a superior protein source to FSM in extruded pellet for growth performance of abalone. Dietary inclusion of a single S. japonica was superior to the combined inclusion of U. pinnatifida and H. fusiforme in the production of abalone. Annual world aquaculture production of abalone (Haliotis spp.) increased from 2542 to 139,594 metric tons in 2000 and 2015 and from 20 to 12,346 metric tons in 2000 and 2016 in Korea (FishStatJ 2017). It expects to increase in future due to high demand for human consumption and the expansion of abalone farms. Therefore, many feeding trials, such as determination of dietary nutrient requirement (Uki et al. 1986; Mai et al. 1995a, b; Britz 1996; Gómez-Montes et al. 2003; Thongrod et al. 2003), development of alterative protein source for casein and fish meal (Uki et al. 1986; Lee et al. 1998; Guzman and Viana 1998; Bautista-Teruel et al. 2003; Cho et al. 2008; Cho 2010; Jung et al. 2016; Myung et al. 2016; Lee et al. 2017), development of alternative terrestrial and marine by-product sources for macroalgae (MA) (Reyes and Fermin 2003; Kim et al. 2016; Lee et al. 2017; Jang et al. 2018) and development of formulated feed (Viana et al. 1993; Britz et al. 1994; Lee 1998; Garcia-Esquivel and Felbeck 2009) for stable abalone production have been performed. Soybean meal (SBM) has been commonly used as an alternative protein source for fish meal in animal feeds including aquafeed for long time due to not only its low cost and stable supply, but also its high protein content (40–50%) with well-balanced amino acid profiles compared to other plant protein sources, which are likely to be deficient in lysine, tryptophan, threonine, isoleucine, or valine (Emmert and Baker 1997; Boonyaratpalin et al. 1998; Storebakken et al. 2000; Kim et al. 2012). 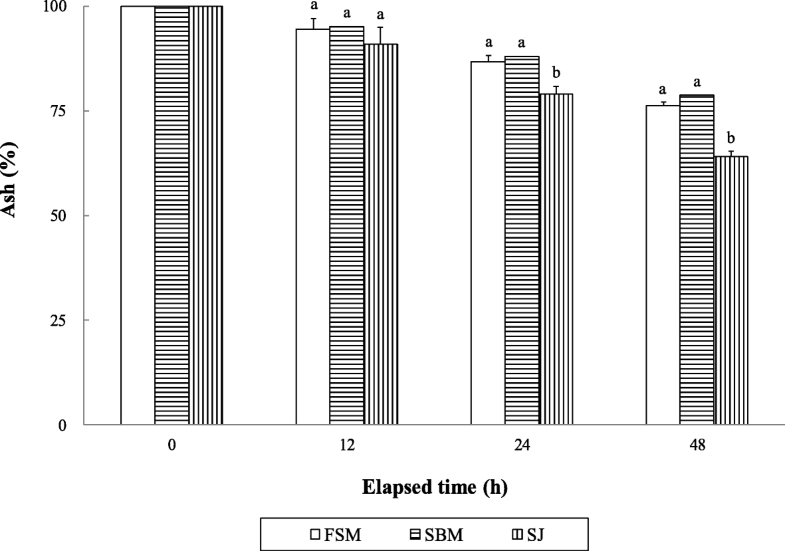 SBM has been successfully substituted for either casein, which achieved the best performance, or fish meal in abalone (H. discus hannai) feed without retardation in growth (Uki et al. 1985; Lee et al. 1998). Cho (2010) also reported that growth performance of abalone (H. discus hannai) fed the diet containing the combined SBM and corn gluten or silkworm pupae meal was superior to that fed a fish meal-basal diet. Dietary inclusion rate of SBM is known to be rather restricted in monogastric animal including fish due to the anti-nutritional factors, such as trypsin inhibitor, tannins, oligosaccharide, and phytic acid (NRC 1993; Francis et al. 2001; Guimaraes et al. 2008). Fermentation is one of the methods to lower these anti-nutritional factors and improve major nutrient content in SBM (Shimeno et al. 1993a, b; Hong et al. 2004; Yamamoto et al. 2010; Gao et al. 2013; Kook et al. 2014). Shimeno et al. (1993b) showed that growth and feed efficiency of yellowtail (Seriola quinqueradiata) fed the pellet containing fermented SBM (FSM) were superior to those of fish fed the pellet containing SBM, resulted from the fact that FSM improved digestibility of dietary protein and carbohydrate and lowered dietary trypsin inhibitor and oligosaccharides content. Wang et al. (2016) also reported that SBM could substitute with up to 30% of fish meal and 45% for FSM, respectively, in turbot (Scophthalmus maximus) diet. Nevertheless, dietary inclusion of SBM and cottonseed meal fermented with Aspergillus oryzae did not improve growth performance, but lowered feed efficiency of Nile tilapia (Oreochromis niloticus) although fermentation lowered dietary and liver gossypol content (Lim and Lee 2011). Dietary substitution effect of FSM for fish meal was rather limited in black sea bream (Acanthopagrus schlegelii) (Zhou et al. 2011). Oral administration of commercially available FSM (PepSoyGen) did not improve growth performance and feed efficiency of white seabass (Atractoscion nobilis) and yellowtail jack (Seriola lalandi) (Trushenski et al. 2014). Kim et al. (2009) also reported that dietary inclusion of FSM would rather depress growth performance and feed efficiency of parrot fish (Oplegnathus fasciatus) although fermentation improved availability of phosphorous and non-specific immune response of fish. Therefore, dietary inclusion effect of SBM and FSM on performance of fish is still controversial. In addition, Lee et al. (2017) reported that substitution effect of FSM with fish meal was very limited when 50% fish meal at 14% was replaced with FSM in commercial abalone (H. discus hannai) feed. Recently, Kim et al. (2017) reported that SBM was a superior protein source to FSM in abalone feed when the experimental diets with 25% SBM and FSM were fed to juvenile abalone (H. discus). Still, inclusion effect of SBM and FSM in commercial feed on abalone is unknown. About 15–30% of macroalgae (MA), such as Undaria pinnatifida or Saccharina japonica depending on their price and seasonal availability is commonly included in commercial abalone feed in Korea (Hernández et al. 2009; O’Mahoney et al. 2014; Jang et al. 2018). Administration of the combined two of three MA (Gracilaria tenuistipitata, S. japonica, and Gelidium japonica) produced an improved growth performance of abalone (H. asinina) over a single MA (Yu et al. 2014). However, Qi et al. (2010) showed that the combined MA (S. japonica and Gracilaria tenuistipitata or Sargassum pallidum) produced poor weight gain for 2-year old abalone (H. discus hannai) over a single MA (S. japonica or G. tenuistipitata). In this study, therefore, inclusion effect of SBM and FSM in extruded pellet on juvenile abalone (H. discus, Reeve1846) was compared in abalone farm. In addition, dietary inclusion effect of the combined MA (U. pinnatifida and Hizikia fusiforme) and a single S. japonica on abalone was compared. Three thousand six hundred juvenile abalone were purchased from a private hatchery and transferred to Deagun abalone farm (Jeju Special Self-Governing Province, Korea). Before an initiation of the feeding trial, abalone were acclimated to the experimental conditions for 2 weeks and fed with dry U. pinnatifida once a day at a ratio of 2–3% total biomass. Six 5-ton concrete flow-through raceway tanks (4.3 m × 0.9 m × 1.1 m; water volume 1.5 ton) with a flow rate of 47.7 L/min were used for this experiment (n = 2 per diet). Juvenile abalone [5.7 ± 0.24 g (mean ± SD)] were randomly distributed into tanks (n = 600 per tank). Sand-filtered seawater, at a temperature ranging from 12.5 to 19.8 °C (mean ± SD 16.0 ± 1.92 °C), was supplied during the feeding trial. Aeration was supplied into each raceway tank, and photoperiod followed natural conditions. The experimental diets were fed to abalone once a day (17:00 h) to satiation with a little leftover (about 2–3% total biomass). Dead abalone were removed daily, and the bottoms of the tanks were siphon-cleaned twice a week. The feeding trial lasted for 120 days. At the end of the feeding trial, 200 abalone were randomly chosen from each raceway tank and then collectively weighed to determine weight gain. Three experimental diets were prepared (Table 1). Thirteen percent fish meal, 23% FSM, 4.4% corn gluten meal, and 3% shrimp meal and 26% wheat flour and 4% dextrin were used as the protein and carbohydrate sources, respectively, in the FSM diet. Twenty-three percent macroalgae (MA), a mixture of Undaria pinnatifida and Hizikia fusiforme at a ratio of 1:1, was included in the FSM diet. Twenty-three percent FSM and MA in the FSM diet were substituted with 30% SBM at the expense of wheat flour and same amount of S. japonica, referred to as the SBM and SJ diets, respectively, to produce isonitronic diets. All diets were formulated to meet the dietary nutrient requirements of abalone (Uki et al. 1986; Mai et al. 1995a, b). The three experimental diets were pelletized by an extruded pelleter (Jyoda, Japan) at Ewha Oil and Fat Industry Co. Ltd. (Busan, Korea). One hundred abalone at the start from an extra tank and 50 abalone from each tank at the termination of the feeding trial were sampled and frozen for analysis. Prior to examination, all samples were slightly thawed, followed by separation of the shell and soft body tissue. Shell length, width, and height were measured to a precision of 1.0 mm with a digital caliper (Mitutoyo Corporation, Kawasaki, Japan), and the ratio of soft body weight to whole body weight (the soft body weight + shell) was calculated to determine a condition index for abalone. Specific growth rate (SGR; %/day) was calculated using the formula of Britz (1996): SGR = [(ln(Wf) − In(Wi))/days of feeding] × 100, where In(Wf) = natural log of the final mean weight of abalone and In(Wi) = natural log of the initial mean weight of abalone. The pooled separated soft body tissue from the sampled abalone from each tank was then homogenized and used for proximate analysis. Crude protein content was estimated from total nitrogen using the Kjeldahl method (Auto Kjeldahl System, Buchi B-324/435/412, Switzerland). Crude lipid was determined using an ether-extraction method, moisture was determined by oven drying at 105 °C for 24 h, and ash was determined using a muffle furnace at 550 °C for 4 h. All methods were according to AOAC (1990) practices. The three extruded diets were placed in separate 70-L plastic rectangular containers (120 cm × 36 cm) without abalone in duplicate. These containers were then placed within a 5-ton concrete flow-through raceway tank at a flow rate of 45.6 L/min and subsampled at 12, 24, and 48 h to evaluate leaching of nutrients in the diets to determine their water stability. Nutrient levels in the diets were assessed using the same procedure described above for the abalone flesh. Water stability of nutrients in the diets was expressed as the percentage of final dry content to initial dry content for each nutrient based on Mai et al. (1995a). One-way ANOVA and Duncan’s multiple range test (Duncan 1955) were used to determine the significance of the differences among the means of treatments by using SAS version 9.3 program (SAS Institute, Cary, NC, USA). Water stability of the experimental diets was tested by ANOVA with repeated measurement designs (Cody and Smith 1991). Percentage data was arcsine-transformed prior to statistical analysis. The retained crude protein content of the extruded pellets was significantly (P < 0.0001) changed over all period of time; however, no significant difference was found among the extruded pellets within the same time (Fig. 1). Crude lipid content of the extruded pellets was significantly (P < 0.0001) changed over all period of time; however, no significant difference was found among the extruded pellets, except at 48 immersion in seawater (Fig. 2). Crude lipid content of the SBM diet was significantly (P < 0.05) higher than that of the SJ diet, but not significantly (P > 0.05) different from that of the FSM diet at 48 h after seawater immersion. Ash content of the extruded pellets was significantly (P < 0.0001) changed over all period of time, and their significant (P < 0.003) interactions (pellets × time) were also observed (Fig. 3). The retained ash content of the SBM and FSM diets was significantly (P < 0.05) higher than that of the SJ diet at 24 and 48 h after seawater immersion. Survival of abalone ranging from 90.4 to 93.5% was not significantly (P > 0.05) different among the experimental diets (Table 2). Weight gain and SGR of abalone fed the SBM diet were significantly (P < 0.05) greater than those of abalone fed the FSM and SJ diets. Weight gain and SGR of abalone fed the SJ diet were also significantly (P < 0.05) greater than those of abalone fed the FSM diet. The longest shell length, widest shell width, highest shell height, and greatest soft body weight were obtained in abalone fed the SBM diet, followed by the SJ and FSM diets (Table 3) although no statistically significant difference was observed between the SBM and SJ diets. However, no significant difference in the ratio of soft body weight to total weight of abalone was observed. Proximates of soft body of abalone were not significantly (P > 0.05) affected by the experimental diets (Table 4). Greater weight gain and SGR of abalone fed the SBM diet compared to the FSM diet in this study indicated that SBM was better utilized than FSM as protein source in extruded abalone feed. 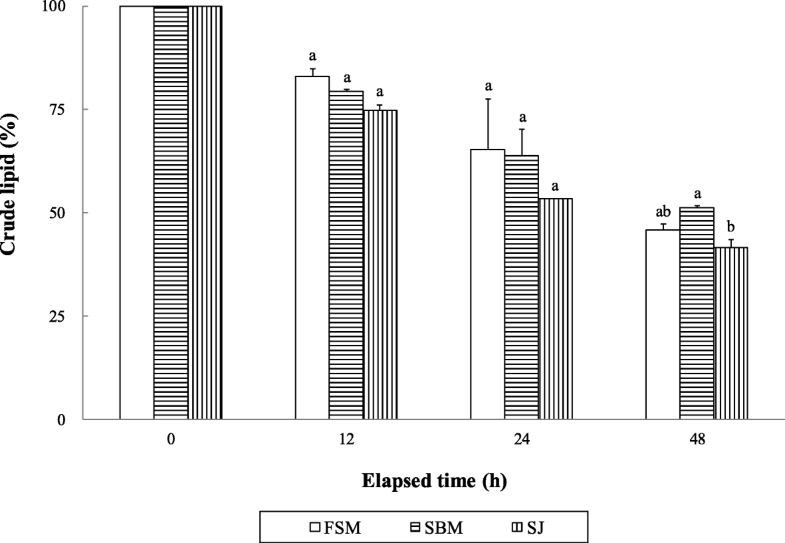 This result confirmed that SBM was a superior protein source to FSM when juvenile abalone (H. discus) were fed with one of the experimental diets containing 25% SBM and FSM for 16 weeks (Kim et al. 2017). 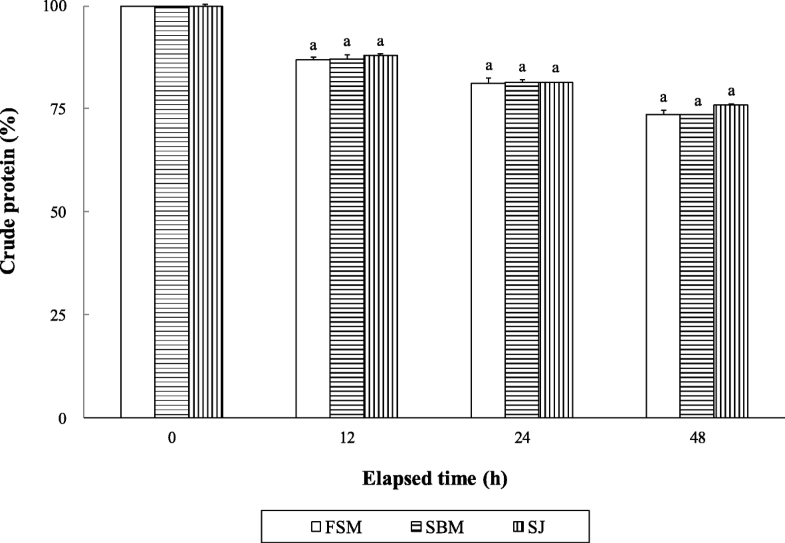 SGR in abalone (an initial weight of 3.0 g) fed the diet containing 25% FSM was estimated to be 0.49 and 0.54%/day for 25% SBM, respectively, and 10.2% [(0.54–0.49)/(0.49) = 10.2%] of SGR of fish fed the latter improved in Kim et al.’s (2017) study; on the other hand, 69.7% [(0.56–0.33)/(0.33) = 69.7%] of SGR in abalone fed the SBM diet (0.56 vs 0.33%/day) improved in this study. Favorable inclusion effect of SBM in extruded pellet on growth of abalone becomes clear. Since abalone are eating MA, such as Undaria or Saccharina containing 40–50% carbohydrate content (Fleming et al. 1996) in wild, utilizing them as energy sources better than lipid (Britz et al. 1994; Monje and Viana 1998; Thongrod et al. 2003), antinutrient factors do not deteriorate growth performance of abalone. In general, herbivorous and omnivorous fish species seem to accept plant-origin feed ingredients and utilize well (Robinson and Li 1994; El-Saidy and Gaber 2002; Hardy 2010; Trushenski et al. 2014). Similarly, dietary inclusion of FSM and fermented cottonseed meal did not affect growth performance of Nile tilapia (Lim and Lee 2011), and oral administration of FSM would even rather depress growth performance and feed efficiency of parrot fish (Kim et al. 2009). Trushenski et al. (2014) also reported that dietary inclusion of commercially available FSM did not improve growth performance and feed efficiency of white seabass and yellowtail jack when fish meal was replaced with the combined traditional SBM and FSM in feed. Matsunari et al. (2010) showed that FSM did not improve growth performance and feed efficiency of rainbow trout (Oncorhynchus mykiss) when fish meal was completely replaced with either the combined SBM or FSM and corn gluten meal in diet. Unlike this study, however, the conflicting results that oral administration of FSM improved digestibility of dietary protein and carbohydrate, but lowered dietary trypsin inhibitor and oligosaccharide content (Shimeno et al. 1993a; Francis et al. 2001; Hong et al. 2004; Yamamoto et al. 2010; Gao et al. 2013; Kook et al. 2014) were reported. Dietary inclusion of fermented plant protein source improved growth performance of fish (Shimeno et al. 1993b; Zhou et al. 2011; Wang et al. 2016). Especially, Yamamoto et al. (2010) reported that lower digestibility values of carbohydrate and lipid observed in rainbow trout fed the diet containing FSM with Bacillus spp. with an initial water addition of 30% for 10 h were highly improved and it resulted to comparable growth and feed efficiency of fish even to fish fed the fish meal-basal diet. They concluded that FSM is a promising ingredient as the main protein source in a non-fish meal diet for rainbow trout. Therefore, practical application of fermentation technique to plant protein source in diet should be carefully considered depending on targeting animals, strain used for fermentation, and fermentation conditions, for example (Shimeno et al. 1993a, b; Matsunari et al. 2010; Yamamoto et al. 2010; Gao et al. 2013; Trushenski et al. 2014; Kim et al. 2017). Greater weight gain and SGR of abalone fed the SJ diet compared to the FSM diet indicated that a single S. japonica achieved better growth performance of abalone over the combined MA (a mixture of U. pinnatifida and H. fusiforme at a ratio of 1:1) in extruded pellet. Although direct comparison in the inclusion effect of a single (S. japonica) and the combined MA (a mixture of U. pinnatifida and H. fusiforme) on growth of abalone could not be made due to difference in MA species used in the SJ and FSM diets in this study, a similar result that juvenile abalone (H. discus) averaging 4.3 g grew better on S. japonica over U. pinnatifida at mean temperature of 19.5 °C (Lee et al. 2016) would be reported. Qi et al. (2010) also reported that the highest weight gain was obtained in 2-year old abalone (H. discus hannai) fed S. japonica, followed by Gracilaria lemaneiformis, the combined S. japonica and G. lemaneiformis, Sargassum pallidum, and combined S. japonica and S. pallidum when five different combination of MA were fed to abalone for 4 months. However, further study to determine direct comparison effect of MA (S. japonica, U. pinnatifida, H. fusiforme or their combination) on performance of abalone is needed in future. Although abalone are slow eaters, water stability of the supplied feed can be one of the most important factors in determining growth performance of abalone and discharged water pollution sources from farms. The retained crude protein and lipid and ash content in the extruded pellets were changed with time in this study, but no distinctive difference was found in either crude protein or crude lipid except at 48 h after in seawater immersion. Water stability of nutrients in extruded pellets obtained in this study seems to be rather high than those reported in other studies (Bautista-Teruel et al. 2003; Gómez-Montes et al. 2003; Lee et al. 2016; Lee et al. 2018a, b), but comparable to that reported by Mai et al. (1995a). None of proximates of soft body of abalone was affected by the experimental diets in this study. However, unlike this study, the chemical composition of soft body of abalone was commonly affected by dietary nutrient content (Mai et al. 1995a, b; Thongrod et al. 2003; Cho et al. 2008; Garcia-Esquivel et al. 2009; Cho 2010; Kim et al. 2016; Myung et al. 2016; Kim et al. 2017; Lee et al. 2018a, b). In conclusion, the retained crude protein and lipid and ash contents in extruded pellet were changed with time. Soybean meal was a superior protein source to fermented soybean meal in extruded pellet for weight gain and specific growth rate of juvenile abalone. Biological measurements (shell length, width, and height and soft body weight) of abalone reinforced the result found to the growth rate. Dietary inclusion of a single macroalgae, S. japonica, produced better growth performance of abalone rather than the combined inclusion of macroalgae, U. pinnatifida and H. fusiforme. This research was supported by Basic Science Research Program through the National Research Foundation of Korea (NRF) funded by the Ministry of Science, ICT & Future Planning. The design of the study, collection, analysis, and interpretation of the data and writing of the manuscript were supported by Basic Science Research Program through the National Research Foundation of Korea (NRF) funded by the Ministry of Science, ICT & Future Planning (2017R1A2B4009773). SHC designed the study and prepared the draft. HSJ, KWL, and PYK ran the feeding trial. JK, AY, and HSK analyzed the chemical composition of the diets and carcass of abalone. All authors read and approved the final manuscript. All experimental protocols followed the guidelines of the Institutional Animal Care and Use by Committee of the Korea Maritime and Ocean University. Lee KW, Kim HS, Jeong HS, Kim J, Yun A, Cho SH. Effect of dietary carbohydrate-to-lipid ratio on growth and carcass composition of juvenile abalone, Haliotis discus, reeve 1846. J World Aquacult Soc. 2018b. https://doi.org/10.1111/jwas.12485.